I wanted so much to use the Mickey silicone food cups so that I decided to make this Disney theme bento. I took out the smaller food cup after the photo shoot because I couldn't close the lid tightly. I turned the bigger food cup so the ears part was inside the box. Andrew is still staying at home. Last night my husband brought him to his pediatrician and luckily he could sleep well last night with no fever. He is still coughing and having a lot of phlegm so I need have to give him home nebulizer therapy and a lot of drink. Inside the box : rice balls (flattened on the top) decorated with crab stick, boiled quail egg, mickey head shapes pork patties, carrot & corn flowers, pea pods, and mash sweet potatoes. Debra from Hapa Bento is organizing a Japanistic Bento Box Contest. You can read all the details on her blog. Prepare your 'Garden Theme' bento now, you may enter up until midnight PDT April 23, 2010. Cute Mickey cups! You find such adorable bento stuff! Glad to hear Andrew is getting better. Hope he improves today. Lots of hugs for him! HOpe yr son will be recovered soon, Lia. Lia this bento looks so delicious. The whole Disney theme works well here. Glad that Andrew is on his way to getting better. It's so hard when our kids are sick. Glad that Andrew is getting better. sounds like andrew is slowly but surely getting better... so glad to hear that! 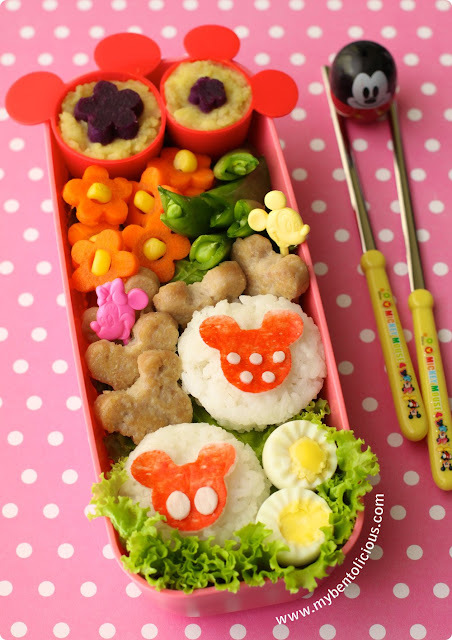 this bento is adorable, love the matching flower shapes and the corn centers, and 3 different kinds of mickey-head shapes too! did the pork patties come that way, or did you shape them? Adorable! I love the mickey theme! I hope Andrew feels better soon, poor little guy! Sending Andrew lots of "feel better soon" thoughts! Darling bento with warm shades of pink and red that I just love! The way you cut the eggs gives me an idea to do the same for my daughter's lunch. I normally just give her the entire shelled egg. Sometimes she doesn't eat it at all. Sorry your little boy is feeling yucky. I hope he starts feeling better soon! @Bento Box/Asfora : Thanks a lot Asfora! u're so talented mbak !!!! So many kinds of tiny cute foods in this bento! Sounds so fun to eat. My daughter also has cold and had a fever last night. Hoping our kids get well soon. I'm reading your blog backwards (catching up on two weeks of posting) so please excuse my numerous comments. I love the little flowers with the corn hearts and the whole mickey theme, including the mickey pork patties :-) Nice work Lia. @Ceinwyn/Ingrid : Thanks a lot Ingrid! Can't thank you enough for all of your kind comments.